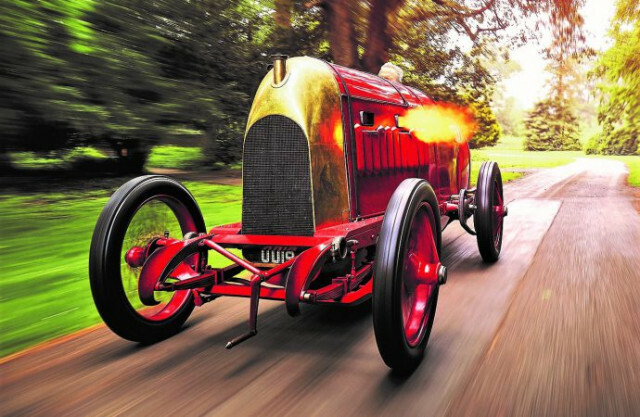 The notorious, fire-spewing 1910 Fiat S76 speed-record car known as the “Beast of Turin” will thunder and quake on The Grand Avenue automotive catwalk at the 2018 London Classic Car Show, to be held February 15-18. The appearance of one of the world’s most-famous early racers will be a highlight at ExCeL London among the 60 vintage Specials, “unique machines that are steeped in history and mystique owing to their exclusive designs and often outlandish performance,” according to a car show news release. 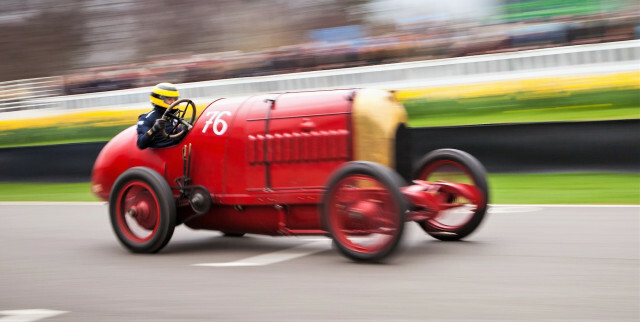 Two Beasts of Turin, powered by behemoth 28.5-liter four-cylinder engines, were created by Fiat to break speed records. They were at the time the fastest cars in the world. The restored Beast, with its strikingly tall engine cowl housing the huge powerplant, appears strangely ungainly. Yet these cars were driven successfully at speed in their day and the survivor runs now during vintage-car demonstrations, when flame erupts from its open exhaust ports with a bellowing roar. “While the remarkable cubic capacity in itself remains astonishing, the in-line four cylinder also boasts some pretty cutting-edge hardware for its era with four valves per cylinder, multi-spark and overhead-cam technology helping it spit out something in the region of 300bhp,” the release says. “Boasting so much beef and brawn, it was no surprise when the first of these colossal chain-driven Edwardian monsters – by now fittingly nicknamed ‘The Beast of Turin’ – was clocked at 116 mph on Salburn Sands, Yorkshire in 1911, breaking the world flying one-mile speed record. After their heyday, the Beasts disappeared from view until British enthusiast Duncan Pittaway found the decrepit chassis of the first one built in Australia. The engine of the second car was located among a pile of old parts in a Fiat factory, nearly a century after the Italian automaker had scrapped the car to prevent rivals from stealing its technical secrets. Pittaway and his team restored the gargantuan red vehicle over a 6-year period, and the collector has driven the Fiat in demonstrations, where it has never failed to awe spectators. “It’s a pretty special car,” he said in the release. “With its bull nose and pointy tail, it was the first to have any streamlining and must have looked like a spaceship in its day. The Fiat will join 59 other historic Specials that will thunder on The Grand Avenue inside ExCeL hall during the London Classic Car Show, which event director Bas Bungish said will be incredible to see and hear. For information about the London Classic Car Show, visit the event website. This article, written by Bob Golfen, was originally published on ClassicCars.com, an editorial partner of Motor Authority.